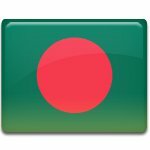 On March 26, the People’s Republic of Bangladesh celebrates its Independence Day. It is the country’s national holiday that commemorates the declaration of independence of Bangladesh in 1971. During the colonial era, the territory of present-day Bangladesh, populated mainly by the Bengali people, was part of the British India. The late 19th century and the early 20th century in Bengal region were marked by the so-called Bengali renaissance, a social, intellectual, cultural and artistic movement that marked the transition from “medieval” to “modern” culture and laid an early foundation for the future independence struggle. After the 1905 partition of Bengal, the largely Hindu western areas were separated from the largely Muslim eastern areas for administrative efficiency. Bengali nationalists, however, saw this move as a “divide and rule policy” and began to protest. In 1911, the British colonial authorities caved in and reunited Bengal. As the British India began its transition towards independence from the British rule, Bengal chose to support the Muslim League rather than the Indian National Congress. As a result, after the 1947 partition of India Bangladesh became part of the newly formed Dominion of Pakistan. However, Bengali quickly grew dissatisfied with the regime and its policies and began to seek autonomy from Pakistan. The independence of Bangladesh was formally declared on March 26, 1971 by Sheikh Mujibur Rahman, who would go on to become the country’s first president. Following the declaration, the guerrilla struggle against the Pakistani rule officially began. The subsequent Bangladesh Liberation War and genocide in Bangladesh resulted in the death of about 3 million people. Eventually the Bangladesh Forces (Mutki Bahini) managed to defeat the Pakistan Army with the military support from India. The Bangladesh Liberation War ended on December 16, 1971, and Bangladesh finally became a fully independent state. The anniversaries of both events – the proclamation of independence and end of the war – were declared public holidays. Independence Day is a national holiday in Bangladesh. Traditionally, the celebration starts in the morning with a 31-gun salute. Festive events and activities include political speeches, ceremonies, parades, concerts, and a wide range of other public and private events that celebrate the country’s history and traditions. The main streets of cities and towns are decorated with national flags, and representatives of various political parties and organizations pay their respects to the martyrs of the Independence War at National Martyr’s Memorial in Savar. On the eve of the holiday, the Independence Day Award is presented to citizens and organizations for substantial contributions in the Bangladesh War of Independence, the Bengali Language Movement, public service, education, science and technology, medicine, journalism, arts, sports, and other fields. The award was instituted in 1977 by the government of Bangladesh; it is considered to be the highest state award in the country.